Bootie Mashup comes to Denver! 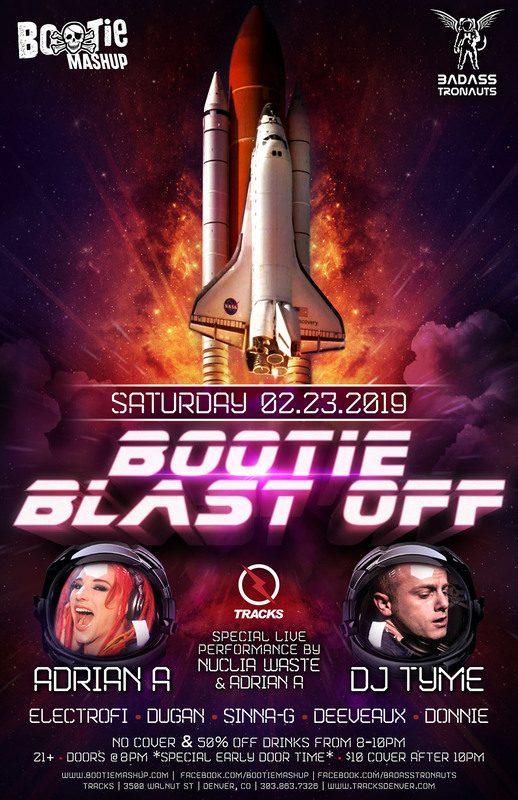 Bootie SF's own Adrian A & DJ Tyme blast off to join the Bad Asstronauts at Tracks Denver for a special one-off party! The Bad Asstronauts and Tracks Denver are excited to announce BOOTIE BLAST OFF! We are pleased to welcome multiple award-winning, special guest DJs and Burning Man legends Adrian A and DJ Tyme of Bootie Mashup – San Francisco, who will be blasting off the decks with the best mashups of all your favorite music in the main room. In the Lounge we are proud to announce special guest Deevaux, along with local favorite Sinna-G as well as Bad Asstronauts DJ’s ElectroFi, DUGAN, and donnie. There will be a special midnight performance by Adrian A and Denver’s own Nuclia Waste.